Beat This Caption Contest 187 Winner – Caption Contest Funny Clever Witty Enter Today! Step 4: Lightly Flour the Meat, and then drop it in the Fryer for 8 Full Minutes! Doctor, can you help me again? 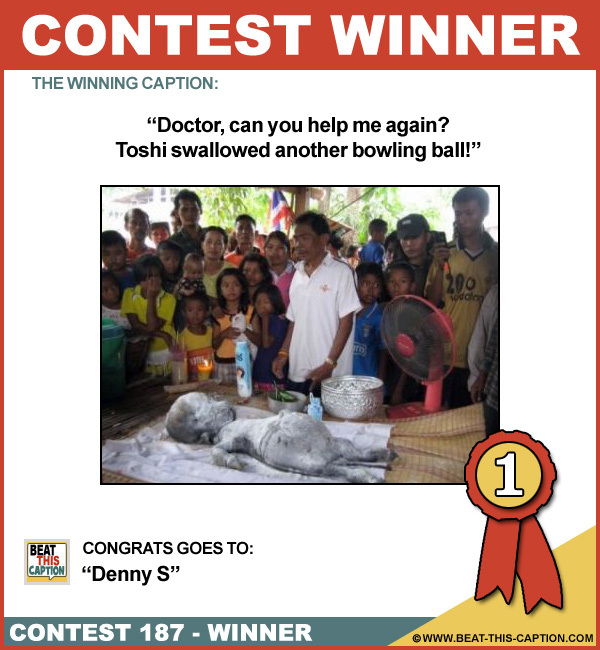 Toshi swallowed another bowling ball! Great Caption! It’s the “again” and “another” that did it! Too funny! :) You WIN! I’ll have the Tandoori chicken, just a baby portion, please! I’m afraid your baby’s anemia is spreading to the table-cloth! She played Duck, Duck Goose once too often! In America, this demon is served as a McRib!